Though its reputation has been hijacked recently by Lord of the Rings worshippers, New Zealand remains a fantastic gap year destination. Whether you want to sail or shop, camp or canoe, meditate or mountain bike, New Zealand offers a host of activities to suit any preference. And you won't even have to speak Elvish to enjoy them! The climate of New Zealand is mainly temperate, though moving between regions will reveal distinct differences. To be on the safe side, pack for any and all weather conditions. Include: sturdy walking shoes, boots, and/or sandals, raincoat or all-weather coat, hat, gloves and scarf, layers of clothing, swimsuits and a comfortable backpack. As a youth traveller, you may be able to save a little money on travel expense simply due to your age. To see if you qualify for special savings, check out cards such as; International Student Identity Card (ISIC) - must be a student, International Youth Travel Card (IYTC) - must be under 26 years of age and Youth Hostel Association - cheapest if you are under 26 years of age. Drafting an itinerary is a great way to organise your thoughts and create an efficient travel schedule. Itineraries are also useful to leave with family and friends, and to register with embassies and high commissions in case of emergencies. Any itinerary for New Zealand has got to include visits to; Tamaki Maori Village in Rotorua on the North Island, Wai-O-Tapu Thermal Wonderland in Rotorua on the North Island, Taupo Tandem Skydiving in Taupo on the North Island, the buried Village in Rotorua on the North Island, whale Watching from Kaikoura on the South Island, kayaking at Kaiteriteri Beach on the South Island and of course Heli-skiing at Harris Mountains on the South Island. 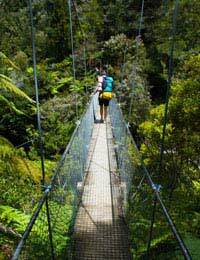 Another way to spend your gap year in New Zealand is to work, study or volunteer as part of a structured programme. New Zealand is not a particularly dangerous country for gap year travellers, but it never hurts to use common sense. Keep your valuables locked at your hotel or hostel and keep your wallet/purse on your person at all times. Never watch bags or carry items for strangers and alert authorities to suspicious behaviour. Avoid deserted areas, and always follow the advice of experienced travellers and guides when entering new environments or attempting new activities.